Three players from the FCBEscola Haikou school enjoyed a magical time at the FC Barcelona facilities this week, in what was surely their greatest sporting experience to date. Sportsmen Lang Dacheng, Li Shibo and Zhan Zhijie, aged between 8 and 10 years old, were selected based on their sporting and human qualities for the adventure, out of the more than 300 participants in the FCBCamps held in Haikou (China) last summer. Lang, Li and Zhan also undertook a series of activities to get further enjoyment from their stay, including a VIP visit to the Barça Experience, the Museum and the Camp Nou alongside director Jordi Penas, and attended Javier Mascherano's farewell press conference to meet him before his move to the Chinese league. They also had the opportunity to have their picture taken with Leo Messi -something that will live long in their memories. 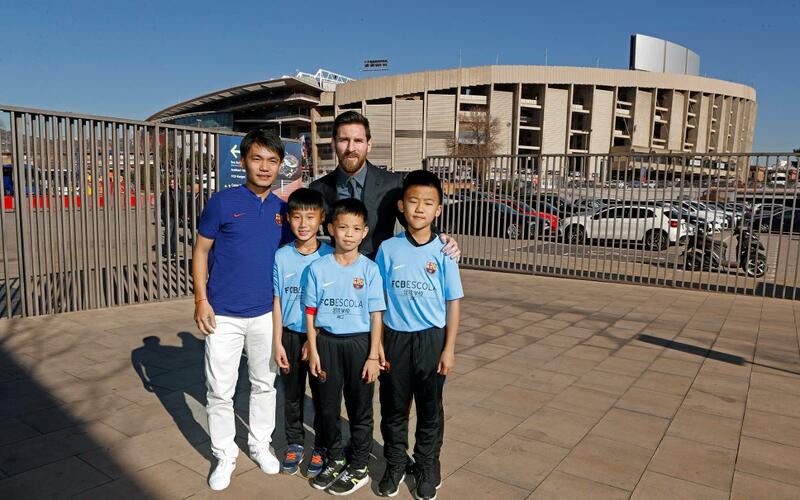 During their final days in Barcelona, the players from Haikou were allowed to watch Barça B training and visited La Masía, where they took in the communal areas and classrooms and played games of table football. The week concluded with the trio getting the chance to step onto the pitch at the Camp Nou wearing their FCBEscola Haikou shirts, alongside the first team before the LaLiga game against Deportivo Alavés.